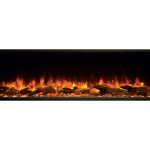 Undulating flame visuals, dancing seemingly impossibly amongst a deep bed of realistic logs or shining crystals, make the Skope one of the most captivating electric fires ever created. 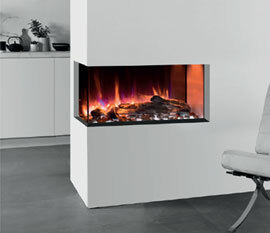 But the Skope doesn’t just deliver mesmerising effects and a fireside glow. 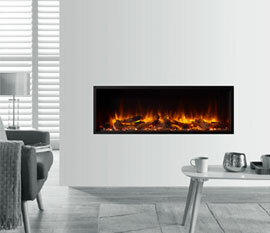 Designed with the very latest LED technologies and offering a choice of stunning fuel beds, this innovative electric fire range lets you decide on the perfect ambience to suit your mood - with only your imagination to hold you back. Conjuring dramatic flame effects, sparkling embers and an enchanting ambience, the Skope’s ground breaking lighting systems effortlessly create the magic of a real fire… and much more. 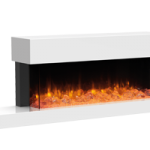 Skope Inset fires are offered in six sizes and are designed to be built into the wall for a minimalist installation that integrates seamlessly with your interior. 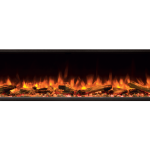 Skope Outset fires allow you to create a bespoke two sided or three sided installation, for a unique focal point that provides a panoramic view of the stunning visuals. 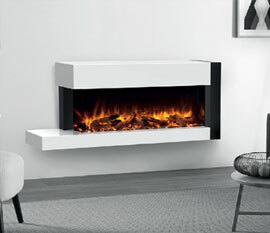 The stylish Trento Suite is available for both sizes of the Outset Skope, offering an easily installable, hang on the wall fire that can be selected in a number of two or three sided configurations. 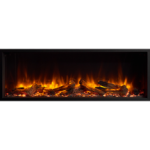 Skope fires use Gazco’s Chromalight triple lighting system to create a mesmerising display with almost endless possibilities. Vivid flame effects are projected to appear amongst the fuel bed for a deep, three-dimensional display and can be set to natural amber, striking blue or even a combination of the two. Each flame colour is enhanced with matching down-lighting, which bathes the fuel bed in either warming amber or cool white for a truly immersive display. 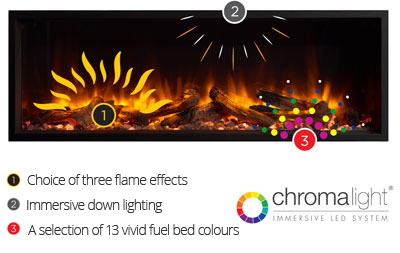 Powerful Chromalight up-lighting illuminates the fuel effects from below, providing relaxing, mood-enhancing ambience whether set to amber, for an authentic glowing ember bed, or one the 13 other atmospheric colour choices. Fuel bed lighting can also transition through each vivid colour for a gradually changing spectrum that provides the ultimate wow factor. Every Skope fire comes with a varied selection of fuel effects that transform the fire’s look and feel. 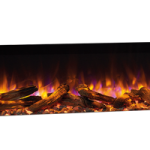 The highly realistic log selection (pictured left) offers a traditional wood fire aesthetic, and when positioned on the bed of clear and grey pebbles looks just like a real fire. 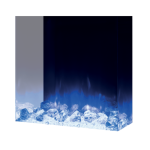 Alternatively, the Crystal-Ice effect fuel bed (pictured right) creates an ultra-contemporary vibe, particularly when paired with the blue flame setting and the many vibrant Chromalight up-lighting colour options. 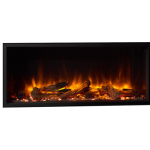 Whichever fuel bed you choose, the fire’s easily removable glass front allows you to quickly mix and match any of the assortment of effects you wish, for your own bespoke display. The Skope’s advanced thermostatic handset gives you full control over the fire’s host of features. 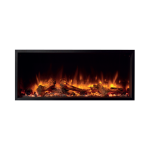 Flames, fuel bed lighting and ambient heating can all be controlled independently to create the desired atmosphere, with or without heat. Innovative energy saving features let you ‘set and forget’ the Skope to turn heating on or off automatically, as well as intelligently manage the heat output to minimise energy use, allowing you to completely immerse yourself in the visual effects. Select Amber, Blue or Amber & Blue flames to suit your mood, with five brightness settings for each colour to give you the perfect ambience. Choose from 13 different vibrant colours to illuminate the Skope’s striking fuel bed, which can be fine-tuned with five brightness levels. Alternatively, you can opt for a gradually changing spectrum as the fuel bed lighting cycles through each colour. Select the optimum room temperature you desire and your Skope does the rest for you. Choose between 15°C and 25°C degrees, and depending on the ambient temperature the Skope will reach the desired level as efficiently as possible. Comfort Temperature lets you set the thermostat as you would your central heating, with Eco and Boost settings, which offer further freedom to adjust the temperature by +/- 4°C if desired. You can manually advance any pre-set heating cycle to either come on or turn off before the programmed time without disrupting daily or weekly scheduling. Adaptive Start allows the Skope to automatically turn on up to 45 minutes in advance of a pre-set time to reach your desired temperature when you want. Set the Skope to turn on to provide heat at certain times of the day, or even days of the week, using the handset’s Daily and Weekly Timer control functions. A sudden drop of temperature of 4°C or more within five minutes, like that caused by an open window, will automatically turn off the Skope’s heat to save energy. Heating can easily be resumed simply by pressing the heat button, or allowing the room’s temperature to rise by closing the window. The Skope’s innovative energy saving features make it compliant with stringent 2018 Ecodesign energy product standards.